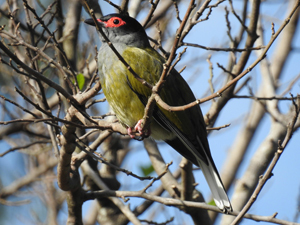 Figbirds are bulky orioles that have a warty buff naked skinned face (similar to the Friarbird) that reddens in excitement; they eat fruit almost exclusively, especially figs, and build very flimsy nests. They are the most wonderful parents, as are the other members of the flock towards all the young born. 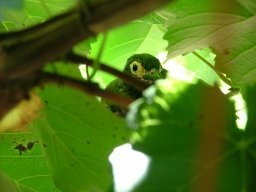 I have raised many baby figbirds, and live near to a great big fig tree. During the day I put the chicks in my care outside in a cage with a perch near to the wire, where they endlessly call for food with big open mouths, and the local figbirds (especially the males!) will do my job of feeding them, bring these little hatchlings fruit, figs and insects tirelessly all through the day. When the chicks have fledged (i.e. are ready to fly and leave the nest or in this case my care) I open the cage when the local birds are around and watching, and they take their first flight up into the trees to be taken up, accepted and cared for by the flock. For a carer this is a perfect scenario when a chick comes into care. Preferring a warmer more humid climate to find fruits more readily, they range from around the north as far up as near Derby, WA east along the coast down to the Illawarra district, NSW. There are 2 races in Australia. They like to keep to gallery monsoon forests, open woodlands, clearings where big trees have been left, parks and are often seen in our gardens especially where their food plants occur such as, native and cultivated figs (which are an important, if not essential part of their diet) native cherries, raspberries, ink-weed, lantana, tobacco-bush, bananas, paw paws, guavas and mulberries. Flowing their food, the flocks are locally nomadic, but rarely travel far. When raising their young they will also eat and then regurgitate many insects to feed the chicks a diet higher in protein, essential for their healthy growth of bones and feathers. (We also feed the little chicks a diet very high in protein when they are in care). 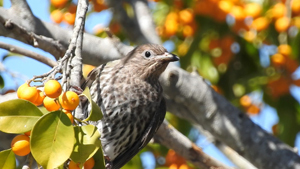 Figbirds are arboreal and pick all their fruit from branchlets in the crowns of trees and shrubs. Flocks are noisy and active and concentrate on a single tree, birds even hanging upside down on the ends of twigs so that they can devour the last of the fruit. They will also swing upside down from perches during rain squalls to bathe. Immatures predominate in the larger flocks, older birds tending to keep to smaller, more sedentary groups. Male and female look completely different and plumage varies considerably with them often being mistaken for different species. 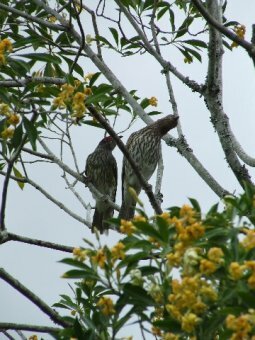 (The male a Friarbird, the female a Wattlebird!). The male is the more elaborate of the two, and has a beautiful glossy black head with a naked skin face, which is yellowish, turning to red when breeding, neck grey and lighter under belly being more grey in the southern form and smoky-yellow in the northern form, the back and wings are yellow-green with tips black, tail is black with broad white tips to the outer feathers. The female is the same size as the male (approx. 280mm from tip of beak to end of tail) their upper parts brown-olive with darker streaks and the under parts are whitish with dark brown streaks. 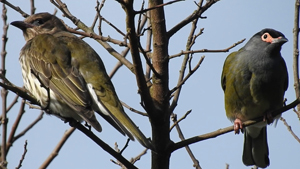 Immature birds look similar to the female except lighter until the males grow there full colours. Call is an emphatic downslurred whistle “tchieuw” or “see-tchieuw” repeated erratically also a loud “scluck”. Song is a mellow “tu-tu-heer, tu-heer, tu-heer” and squeaky notes. Breeding time is late September – February and in good years the female may nest a second time. They breed in pairs building a light nest, more like a deep saucer, made up of loosely woven vines and fine twigs slung from a horizontal fork near the thin end of a branch usually fairly high up in a tree. (Often the young chicks get blown out on these nests in the strong winter/spring winds, and are found by caring people, which is how they end up in our care. The young chicks are born altricial or helpless and are completely dependant on their parents and would not survive on the ground out of the safety of their nests). Laying normally 3 small oval eggs which are dull green in colour with brown and purple spots, both sexes share the incubation and then feeding time when the chicks hatch. Fruit, figs and insects are regurgitated and held momentarily in the parents beak above while the little chicks open their mouths wide, beaks pointed towards the sky, shaking their heads wildly waiting and then the adult drops the food down into their small eager mouths and throat. Other birds, especially males, will come and feed the chicks as well. If you wish to attract these lovely birds to your garden plant native fruit bearing trees and shrubs and encourage your neighbours and council to do the same. Sit back and enjoy their natural beauty!